How clean is your Email data? We offer a simple, speedy and comprehensive pre-send email screening solution on email marketing databases of any size covering all B2B, UK and International email addresses. 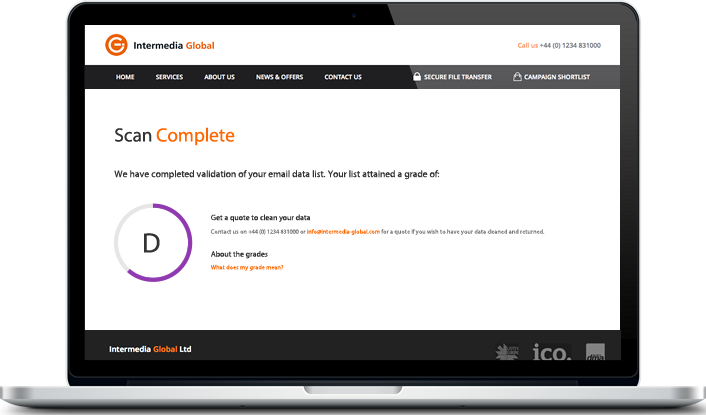 Our email validation tool offers a full quality report and data download service with validation flags and reasons is also available and we can remove and clean bad records if required. But in advance of any commitment, take advantage of a free quality rating report by uploading some sample data the report will be generated and viewable online. Keeping email addresses clean and deliverable, whether they are business, consumer or international is an increasing problem. Email addresses change frequently or they are incorrectly entered on web sites and CRM systems making communication less effective than it should be. Our Email validation tool helps eliminate bad records that will bounce and to flag duplicate addresses, ensuring the maximum volume reaches the intended recipient. All costs are considered when calculating the return on investment (ROI) of any campaign. Paying for the broadcast of email addresses that do not reach their destination is frustrating and can be avoided or minimised for sure. It is common to hear of 15-20% bounce rates within campaigns. Reducing these to an absolute minimum will offer true measureable statistics of open and clicks and sales against the actual volume that reached the intended recipients. We will scan and test the deliverability of your email marketing data for free based on a series of technical qualifiers, you are then given an accurate grade listing of the quality of data and the option to clean the list. We will automatically grade your email marketing database for free, if you decide to clean the list, you can take advantage of our low cost per record scan. We offer the same great service and price regardless of the size of your company and we use bespoke algorithms to ensure your data is clean as quickly as possible. Simply upload your email marketing data to our secure server, we will scan and grade your data so you can get an accurate sense of how deliverable and valid your email list is before sending it out. Our comprehensive validation process uses similar methods to those used when sending email to ensure that our results are accurate. We maintain a rolling blacklist to ensure that any rogue addresses are filtered out and have a host of validation methods in order to keep each scan as fast as possible. Upload your file in CSV format and upon completion we will start validating your email data immediately. Our comprehensive free validation process will provide you with a grade based on data validity and deliverability. Your cleaned email marketing file will include all email addresses indicating which rows contain issues and issue type per entry. With clean data you will have greater measurability of a campaigns success and lower your mail send costs! Our 256-bit encrypted SSL secure connection means the transfer of your data to our server is private and secure. Your data will be deleted from our servers automatically after 30 days and is never shared any third parties.